In the uneasy times between CP/M and DOS, there were several machines meant for those wanting the best of both worlds. This was one of them. 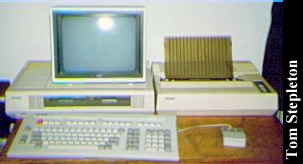 In 1984/5, the Epson QX-16 featured both a Z80 and an 8088, 512k of RAM, and built-in CGA video for a green-screen monitor whose phosphor glowed long after the power was off. It had a keyboard modeled after the Televideo 920 terminal and supported identical screen control codes. The keyboard is also easily the most intuitive I've ever used; it has keys with labels such as "Bold", "Mail", "Print", not to mention the big red "Stop" on the left. It also came with an Epson FX-85 printer and an extremely clicky Logitech mouse, not to mention gobs of software and even an honors thesis (previous owner was a med student). Runs CP/M-80 2.2. Other Z80 / 8086 hybrids include the DEC Rainbow. Click here to view all comments for the Epson QX-16 and to leave your own. Click here to view comments about other Epson computers.